How To Make Clarified Butter: A More Useful and Natural Butter! 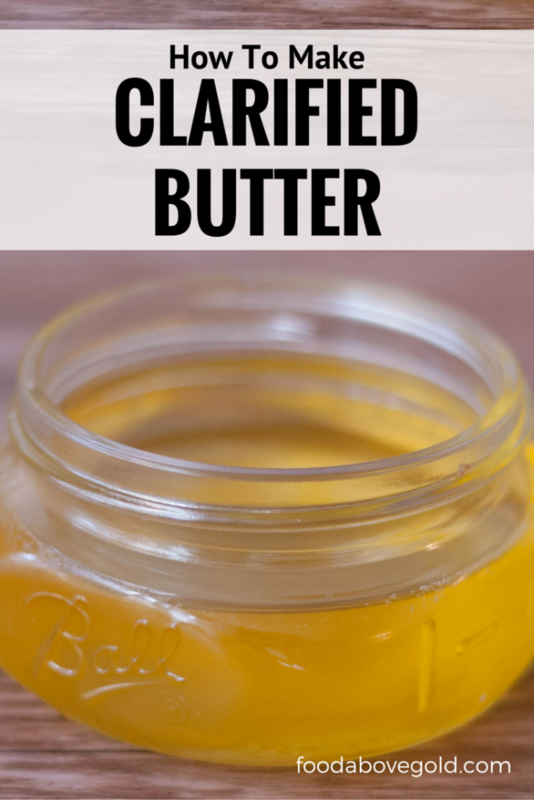 Clarified butter is different from drawn butter and ghee and works with diets like Whole30 and Paleo. Learn how to make clarified butter at home and discover its benefits for your daily cooking. Note: This post was updated on August 13, 2018 with new content for your enjoyment! Clarified butter is the fancy “keep your pinkies up” version of butter. This simple but helpful process can make a huge difference in your kitchen. The popping and splattering butter does when it melts is when the water sinks to the bottom and boils out. The weird white foamy scum that floats to the surface are the milk solids (the dairy). Clarified butter is made by melting butter until the water and milk solids have separated from the pure butterfat. After straining, the remaining golden butterfat is saved as clarified butter. Clarified butter is often used in traditional french cooking as well as Indian cooking. It stays fresh for up to six months in the refrigerator or freezer. However, since it does not have milk solids in it, many people also keep it on their countertop at room temperature. While it’s easier to grab a tablespoon of fresh butter, there are important benefits to reaching for clarified butter instead. Higher Smoke Point. High heat cooking is more likely to burn the milk solids in regular butter. This includes using cooking methods like sautéing, pan-frying, and stir-frying. Normally butter has a smoke point of of 350°F, but clarified butter has a higher smoke point of 485°F. This allows you to use butter while cooking at very high heat. Shelf Life. Since clarified butter doesn’t have milk solids, it is significantly less like to spoil or go rancid. This lets you to keep it around much longer than fresh butter. This is also part of why you see it sold as a shelf stable ingredient at grocery stores. Allergies. When the milk solids are removed so is most* of the lactose and casein. This means that most people who have milk allergies or are lactose intolerant can still enjoy it. Consistency. Clarified butter is ideal for many cooking techniques because the water has been removed. The water content in regular butter can change the consistency of what you are making. This is especially true with fine sauces like Hollandaise or béchamel. I often get asked if clarified butter is the same as ghee. The answer is no, not exactly. The end product is technically the same for clarified butter or ghee; the butterfat separates from the milk solids and water. However, ghee has a slight change in the procedure to create a more full bodied, nutty flavor. Ghee is like the halfway point between clarified butter and browned butter. It is also more commonly used in Indian cooking. Can I Buy Clarified Butter? Yes, you can. You do not have to make it home to still be able to get the butter flavor. However, buying it from the grocery store means trading control over it. If you want a fresh, natural, uninhibited flavor, make it at home. If you need convenience, the jars of ghee or clarified butter will do. It only takes fifteen minutes to make, but the quality of making it at home is worth it. Since diets like Paleo or Whole30 allow clarified butter, it is now easier to find it at the grocery store. It is usually in the baking or “ethnic” food aisle, depending on the store. Just like with anything else, the quality of the ingredients matters. Unsalted butter has the freshest and simplest taste to it. If you can get some from a local dairy, it will give you a more distinct, natural flavor. You should expect to lose about 25% of your butter volume during clarification. Make sure to account for that if your recipe calls for a specific amount. Now that you know how to clarify butter, put it to use with these recipes. Use this dairy free, low carb, uninhibited alternative to butter for cooking at higher temperatures. Its pure flavor makes cooking with butter so much better! In a heavy-bottomed pan, melt the butter over very low to moderate heat. Continue to heat it until the butter stops popping and producing foam. If you let the milk solids caramelize it will turn into browned butter. Browned butter has a nutty flavor and doesn’t always pair well with certain dishes. Avoid this by keeping the heat low. Remove the butter from the heat and use a spoon or a ladle to skim the milk solids from the surface. Be careful to not remove any of the golden butterfat underneath. Don’t stress if you can’t get it all. That’s what the next step is for. Strain through a fine mesh sieve lined with a few layers of cheesecloth. This will catch any leftover milk solids. Pour into a jar and store. *trace amounts are always possible. Please consult a doctor for any questions about/before using clarified butter with allergies. You are so good at buttering me up. 🙂 haha! I ADORE puns. I find them very “punny”. In fact, they are probably the greatest source of humor in our household. I haven’t made clarified butter, but I use ghee all the time in indian cooking. This is a great idea! Mackenzie, what are some common recipes or ways to use clarified butter instead of regular butter? Catie, you can use clarified butter in place of anything that requires butter. I most commonly use it when I want to cook something that I don’t want water in – usually things that need high heat – like stir-fry, popcorn, or butter sauces. There aren’t a lot of recipes that are built around clarified butter, but it’s handy to keep around. I know that’s not a specific answer to your question, but the possibilities are as numerous as the way you personally cook allows. Can u buy clarified butter? Or do u have to make it? Hi Janet! Yes, you can buy clarified butter. Many of the higher end food stores, like Whole Foods or even Trader Joes, sell it. It may be packaged under the name “ghee”, but even the regular grocery stores are starting to sell it some form. Thanks for stopping by! I hope that helps! Love how easy you made making clarified butter sound. It’s a great thing to have on hand. I usually buy the clarified butter at the grocery store but I just might try making it after looking at your recipe. I love making it myself. I find that I have better control over flavor and quality without a huge time investment! I hope you try it out! huh. It just goes to show, you learn something new every day! I sure didn’t know that ghee wasn’t the same as clarified butter. I have a local chef that gives me ghee made from grass fed cow milk and it is divine. He does small quantities of browned butter ghee which takes it a step further. It’s delicious! I love that you get your ghee from a local chef! That’s the way to do it!